Smooth sailing with two opposing straight eights separated by an angle of 45 degrees, the immense black-enameled block held an amazing 452 cubic-inches and churned out a whisper-silent 165 horsepower. It had no loud superchargers, and a hydraulic valve lash adjustment system developed by cadillac further reduced noise. For the lucky driver (as often as not a chauffeur), the byword was smooth. going to camp the front and rear compartments of the fourВ¬seaters were simply but elegantly appointed, and if passengers in the rear wanted privacy, they could just roll up a second windshield. A rear dashboard also had a speedometer and clock, and a large trunk the kind you might take to camp, only nicer sat over the chromed rear bumper between enormous chromed fenders. 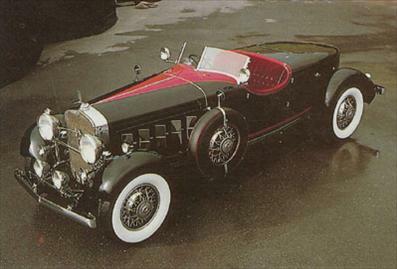 This cadillac v16 is a custom sport roadster, a one-off body. It was designed in 1930 by pininfarina.